Hi my name is Dawn and I would like to welcome you to Gentle Soles Foot Health Care. Gentle Soles Foot Health Care is more than just a business, we care about your comfort and are committed to listening to you to ensure that treatment is tailored to best suit your needs. We offer a holistic approach to our visits to your home and will make you feel safe and at ease during your Foot Health Treatment. 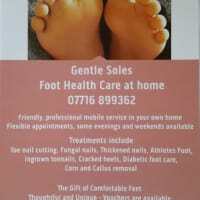 Gentle Soles Foot Health Care is a friendly, professional mobile service which will come to you in your own home. Dawn provided an brilliant service, which was personal and solved the problems I had. She went above and beyond what I needed and my pain was relieved instantly. 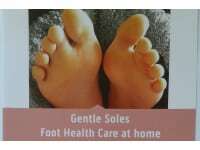 I'd definitely recommend Gentle Soles to anyone with niggling feet or toe pains. Being an older lady I would really recommend Dawn. She is certainly great at sorting feet and nails. She is so warm and friendly and made it a very relaxing experience. My first experience of having foot treatment for a ' corn'! It was great, so relaxing. Cracked heels treated after a hard summer too. I would thoroughly recommend Dawn. Warm friendly and very professional. Hi Vanessa I'm so pleased your cracked heels are looking and feeling so much better.